We are thrilled to officially announce that our new AMI Member Hub is now live! 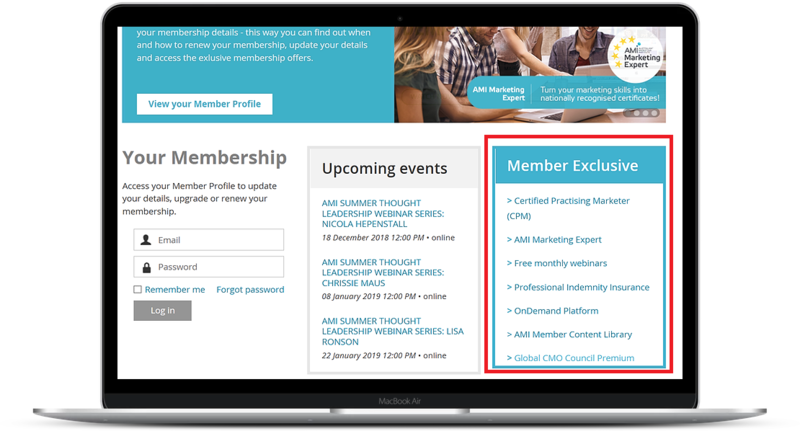 The AMI Member Hub aims to provide a more seamless Member experience. As an AMI Member, you can view member-only content, sign up for events, and interact with other members through the CPM member directory. You can also perform self-service functions such as updating your profile, paying invoices, and renewing your membership. In this guide, we'll help you get started, show you how to manage your membership, and introduce you to some of the functionality that might appear on your new Member Hub. 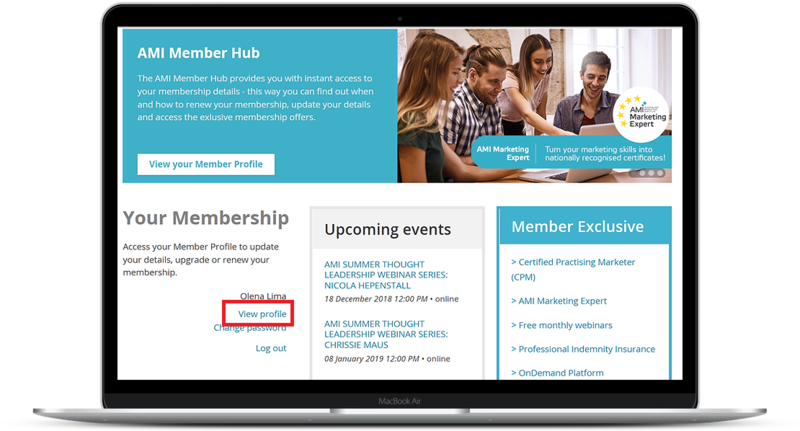 To get the most out of our new Member Hub please keep your Member Profile and subscription settings up-to-date, so we can tailor our communication according to your interests. You have to log into your Member Hub account if you want to access member-only pages, or if you want to change your email preferences or pay an invoice. 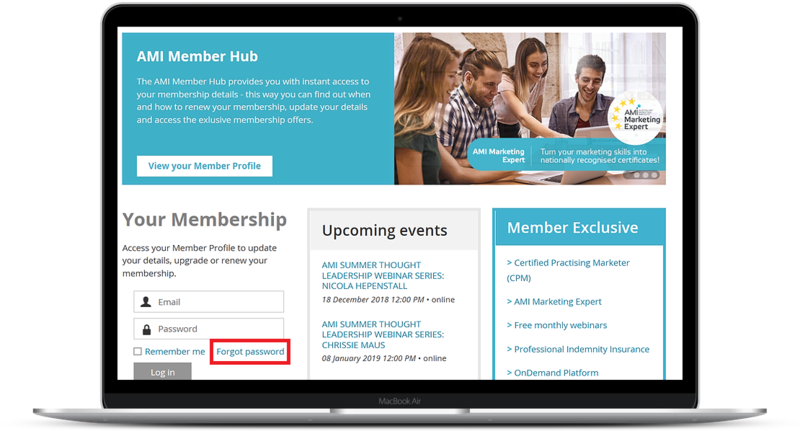 To activate your Member Profile on the new AMI Member Hub, please create a new password by clicking the Forgot Password link located below the Login form. You'll need to use your email associated with your AMI membership account. Please DO NOT use your AMI Membership number to log in. If you're experiencing any isses with logging in or forgot your email, please contact the AMI membership team. New members are automatically logged in after supplying their email address when they apply for membership, register for an event. When you log in for the first time we encourage you to update your Member Profile and verify that your information is correct. You can control which information from your member profile will appear to the public and other members on member directories, and whether your member photo albums are visible to other members and non-members. To change your initial privacy settings, click the Privacy tab within your member profile then click the Edit profile button.To change the privacy level for an item, click the circle under the appropriate column to limit access to anybody, members only, or no one. You can easily access Member Resources and special offers available to Australian Marketing Institute Members. Resources are constantly updated and we encourage you to visit the AMI website regularly to keep up with the latest insights. 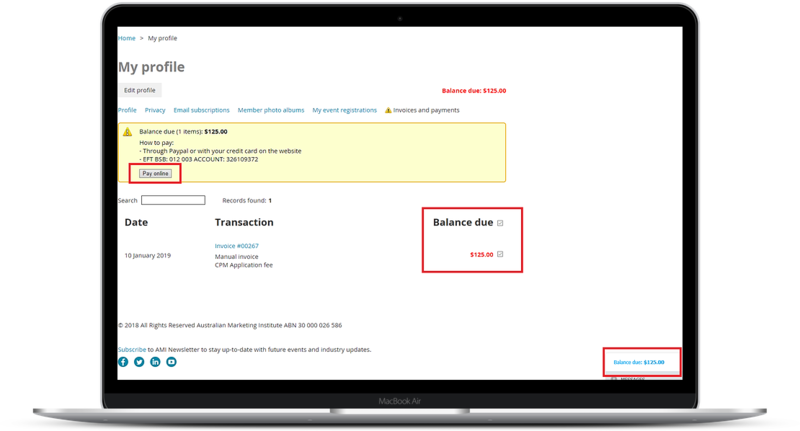 If you have any unpaid invoices, a message will appear after you log into your AMI Member Hub in the bottom right corner. To view or pay the outstanding invoice, click the link. You will be taken to the Invoices and payment tab on your member profile, where you can view and pay invoices, and view past payments. You can also access this screen by displaying your member profile then clicking the Invoices and payments link. Invoices with open balances (unpaid or partially paid) will be shown at the top of the screen. To pay one or more outstanding invoices, click the checkbox beside the invoice(s) you want to pay, then click the Pay online button. You will be taken to an online payment screen where you can enter your credit card details or pay via PayPal.